Couple of weeks go, my fellow food blogger, Ivonne from Cream Puffs in Venice, tagged me for a cookbook meme. The topic sounded so delicious that I saved it for a relaxing sunday morning when I don't feel like agonizing over which picture of a dish to use for a post or how exactly to explain a particular cooking technique. Believe it or not, not that many. 26. Why so few? Well, I have a strange relationship with cookbooks. I didn't grow up with them. My Mom is an intuitive cook and that's how I learned to cook. In fact, I would probably fail the cooking literacy test about 7 years ago. It's only when I started writing down my own recipes that I learned how many tablespoons are in a cup and how many cups in a quart. I didn't acquire my first cookbook until my last semester of college. Which book did you buy most recently? How to cook meat by Chris Schlesinger. Since I mostly cook fish and veggies, meat still posses some challenges for me. I can make great braises and steaks, but roasts are tricky. It's rare that I cook such large pieces of meat, and without practice, it's hard to get better. I got this book to learn some guiding principles for cooking meat roasts, like what's the difference between roasting at a low temperature vs. high temperature, when to sear before roasting, when to remove connective tissue and when to keep it, etc. I haven't actually followed any recipe from this book yet, but from just reading it, I didn't pick up any insights yet. Chris seems to be more into exotic sounding ingredients than into technique. Which book did you read most recently? My dear Julia. I was learning to make cream puffs and there is nothing like having Julia Child in the kitchen with you. That's why I love that book so much. It's not a bunch of ingredients with some basic instructions. It's just like having a teacher at your side helping you through every step, warning you about pitfalls, and helping you avoid them. 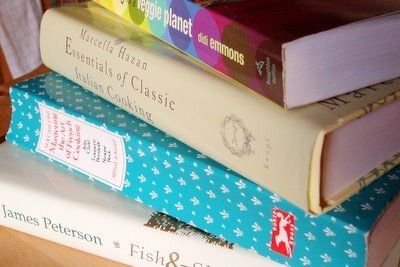 List 5 cookbooks that mean a lot to you? Mastering the Art of French Cooking by Julia Child– this was my first cookbook and a gift from my husband, then fiancé. Essentials of Classic Italian Cooking by Marcella Hazan – wonderful and extremely detailed instructions. After our trip to Italy, 2 years ago, I couldn’t wait to recreate all those dishes at home. Jamie Olive with all his pizzazz turned out to be completely useless. “Throw some flour and eggs together, knead a little, and roll it out.” What kind of pasta making instructions are those?! That’s when I got Marcella’s book and was hooked on it ever since. I rarely follow specific recipes, but use it more for learning techniques like how to make pasta, gnocchi, risotto, etc. Fish and Shellfish by James Peterson – I got Peterson’s book when I was doing research for the “Competition” section of a fish cookbook proposal. The fish cookbook got put on hold since I started Beyond Salmon blog and realized that I can get this content out much faster and easier than trying to publish a book. But I learned an awful lot in the process of doing research for it. After reading through 20 or so fish cookbooks, I found only 2 good ones: Peterson’s and Bittman’s. While Bittman is all about recipes, Peterson is all about the technique. It’s amazing how much I learned from him without following a single recipe! That’s my kind of cookbook. Not that his recipes are not inspiring. It’s just that once you read his explanation and really understand how to work with your ingredients, you don’t need to look at the recipe while you are cooking. Entertaining for a Veggie Planet by Didi Emmons– I got this book at the vegetarian food and wine pairing class I took from Didi Emmons and Eden Stone a few years ago. Didi is just fun to read. Her food is interesting and yummy and her recipes are clear but concise (very few people can pull that off). A gift to young housewives by Elena Molohovetz – my parents gave me this pre-revolutionary Russian cookbook for my birthday this year. It’s more of a culinary history book than a cookbook, but I found it very inspirational. It's now my turn to tag. How about Kuidaore, Off the Bone, Erin Eats, Boston Chef, and Bribe me with a Muffin. We would like to participate in your questionaire but we have one problem - we only have a couple of cookbooks! I have a hand-me-down Betty Crocker cookbook, a Southern Living cookbook that my cousin bought for us for our wedding, and a Cooking with Beer cookbook that's pretty funny - not too much use though. All of our cooking ideas and recipes come from the web! What we ended up doing was saving the print-page versions of hundreds of recipes in one folder of our Favorites - then we print them out on-demand. We eventually bought a 3-ring binder to save the recipes we were printing out, organized in sections like a tradtional cookbook. It's our own compiled cookbook! Coincidentally, we happened to be in a bookstore yesterday and I was browsing the cooking section and ALMOST bought the Les Halles cookbook by Anthony Bourdain. What would be cookbooks that you'd recommend? If you could have only one cookbook, what would it be? Actually I found your use of the web instead of cookbooks very interesting. That's where many of my recipes come from too. Maybe we can bend this meme a little and make it recipes sources, not just cookbooks... I'd love to hear what websites you like to use. When I buy cookbooks, it's mostly to learn cooking techniques, not to get recipes. For that, Julia Child and Marcella Hazan are my two "can't-live-without" books. Great response. And I think it's so sweet that your husband bought you your fist cookbook. Adorable! Well this is a little embarassing but out of the almost 100 cookbooks I've owned (from Jacques Pepin to Lorna Sass) the one that has proven both easy, healthy and educational has been Saving Dinner by Leanne Ely. She uses basic ingredients (of which I was doubtful at first but everything had generally good flavor you could adapt with further repetition), lots of various cooking techniques (so you end up getting a refresher course on techniques you forget you can use), and she sets up her book in a seasonnal way (which is great since I have a terrible memory for what is in season when). Its meant to be a cookbook for a family oriented lifestyle and it works! I am a very cyclical cook (organization issues) and her book made me cook, consistently for weeks at a time, recipes that I was very proud of. I also use the internet extensively, specially Bon Appetit's site but also food network.